To Cite: Ghislanzoni L H, Berardinelli F, Tagliatesta C, Lucchese A. 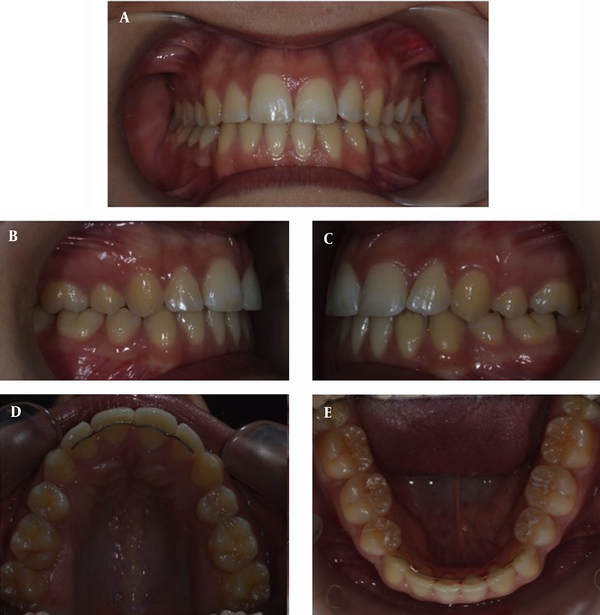 Management of Complicated Crowding and Upper Midline Shift Associated With an Impacted Mesiodens: A Case Report with 2 years Follow-Up, Iran J Ortho. 2017 ; 12(2):e8076. doi: 10.5812/ijo.8076. Introduction: Mesiodens is the most common type of supernumerary tooth with proportion of males: females of 2: 1. The etiology of this anomaly is various and includes both genetic and environmental factors, syndromic conditions and disturbances in dental development. 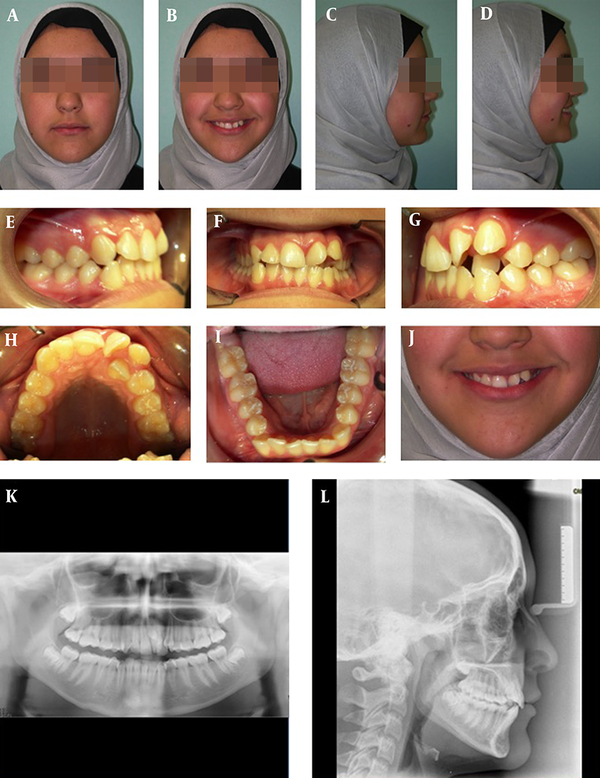 Case Presentation: A palatally positioned maxillary midline mesiodens was incidentally found during x-ray check-up in a 14-year-old female. It was associated with major crowding and a huge upper midline shift. The oral surgeon did not deem prudent a surgical access due to crowding. Patient was treated with screw-borne active anchorage, all four first bicuspids extracted, braces bonded on both arches and consequent mesiodens surgery removal. After alignment a safe palatal surgical access was available. Satisfactory functional and esthetic results were achieved and stable at a 2-year follow-up. Supernumerary tooth is a developmental anomaly of number characterized by the presence of an extra tooth in addition to the normal dentition. The most common type of supernumerary tooth as indicated by Alberti et al. (1) is Mesiodens (MD). It usually occurs in permanent dentition, in the central region of the maxilla and rarely found affecting primary dentition and it is more frequent in men than in women 2: 1. It erupts palatally in only 25% of cases, while it is usually retained in an interincisal position without symptoms in 75% of cases (2). Mesiodens (3, 4) range from a simple conical shape to tuberculous crown shape and its etiology includes positive family history along with predisposing factors, such as genetic or environmental (5, 6). Another theory, involves hyperactivity of the dental lamina that develops into an extra tooth bud, hence a supernumerary tooth (4). It can cause pathological conditions (bone deformity, delayed eruption, impaction of the central incisors, adjacent roots resorptions) (6, 7). An early diagnosis with panoramic radiography is recommended. Further documentation may involve an occlusal x-ray or, better, a CBCT to detect its three-dimensional position and relationship with surrounding tissues (8). The treatment of choice is MD extraction (9), but the appropriate timing depends on morphology, position, surgical access, potential effect on teeth and surrounding structures, and patient age. 1, Maxillary central incisor impaction; 2, tooth retention or delayed eruption of permanent incisors; 3, axial rotation or inclination of erupted permanent incisors; 4, eruption within the nasal cavity with diastema formation; 5, intraoral infection, pulpitis of mesiodens; 6, root anomaly; 7, root resorption of adjacent teeth; 8, cyst formation accompanied by bone destruction. According to the permanent teeth displacement, surgical exposure, adjunctive periodontal surgery and, possibly, mechanical traction are likely to be required (11). Extraction should be completed as soon as the supernumerary tooth can be removed without harming the developing normal teeth (12). Its form is a palatal peg-shaped tooth, it rarely erupts by itself, can cause a huge midline deviation therefore an early and thorough diagnosis is highly recommended (13). The treatment of choice is MD extraction but if the surgical access is too risky, an orthodontic preparation may be required. 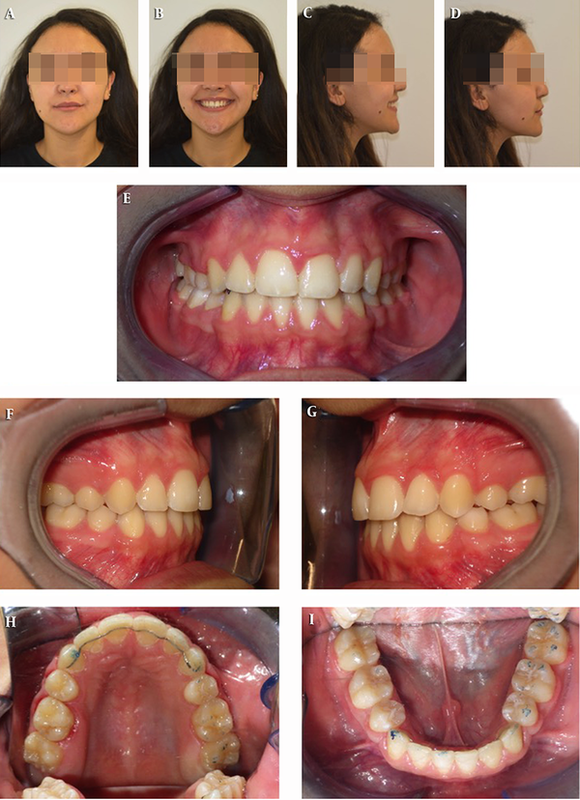 The purpose of this article is to show an orthodontic approach to solve a complex case where a MD causes a strong alteration of teeth eruption and an evident esthetic problem due to smile asymmetry. 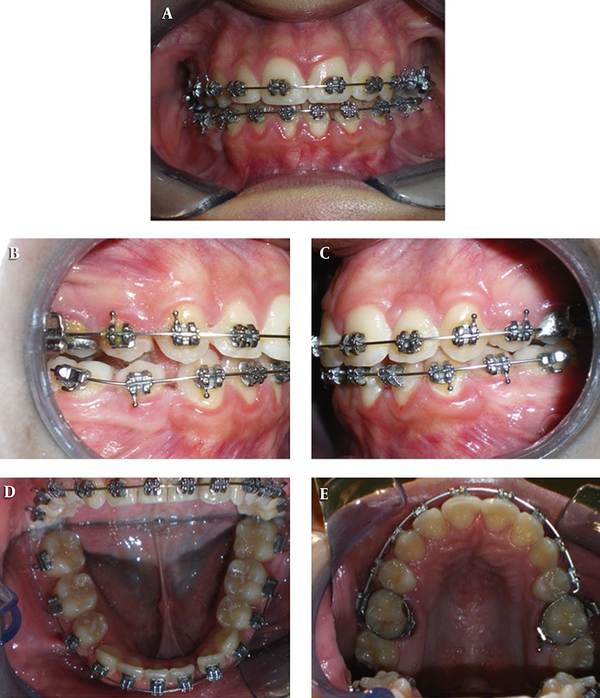 A 14-year-old female presented at one of the Author’s (LH) private orthodontic office. She was a normal healthy child with noncontributory medical and dental history. The patient chief complaint was an asymmetric and unaesthetic smile. The radiographic examination revealed an asymptomatic maxillary midline supernumerary MD supported by an important anterior upper left crowding with upper midline shift. The intraoral soft tissues were healthy and she practiced good oral hygiene; no carious lesions were evident and no restorations were required. She presented a permanent dentition stage with a shallow overbite, class I molar relationships, upper and lower crowding, 3 mm upper midline deviation to the left and a harmonious profile. The MD in the anterior palatal part of the second quadrant caused anomaly of eruption of 21, 22, 23. Preoperative condition demonstrates crowding, midline deviation, and presence of MD (Figure 1). Labial and palatal palpation was not helpful in locating the MD and CBCT radiographs were taken to localize the supernumerary tooth and assess the potential surgical approach (Figure 2A). Correction of dental crowding with dental extraction, create normal overjet and overbite and CLI relationships, Midline correction, Mesiodens extraction. After localizing the MD in the CBCT, it was decided to partially solve the crowding in the upper incisors region before extracting the MD, due to its proximity to the roots of 21 and 22. Preliminary orthodontic treatment was considered a safer option before surgical MD extraction. As the patient profile was harmonious, a four first premolars extraction treatment plan was proposed to the patient. The aim of extractions was to get enough space to correct the upper midline and the crowding in the upper left area. An extraction therapy would have allowed to preserve the soft tissues and avoiding incisors proclination due to mechanics of space creation. The patient chose the extracting solution. A miniscrew anchored distal-jet (2 miniscrews of 8 mm length), was set in the palate to maximize molar anchorage during canine retraction with a passive self-ligating appliance (SmartClip™ SL3 Self-Ligating Braces). The active spring of the distal-jet was used to counteract molars mesial force during sliding mechanics and canine retraction. 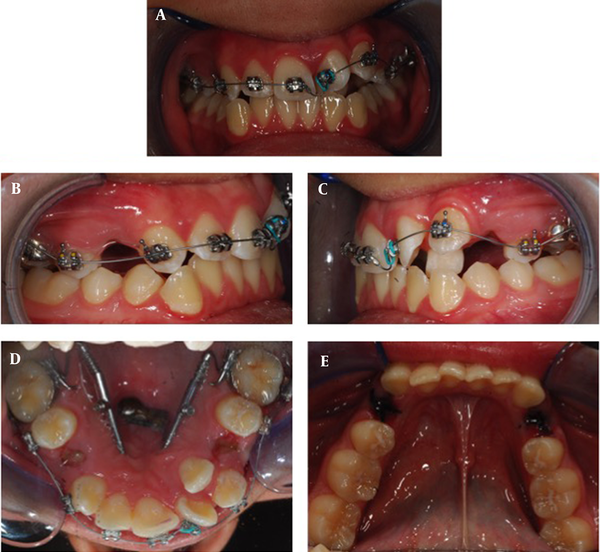 A full canine retraction was necessary to allow upper midline correction and create enough space to recover 22 into the upper arch (Figure 3). Having an anchorage support via the miniscrew anchored distaljet, canine distalizing mechanic was used at treatment early steps. The treatment rapidly progressed to a 0.019 × 0.025 SS main arch wire which was the main working wire for sliding mechanics. When enough space was available, a double arch approach (0.019 × 0.025 SS main wire, .013 CuNiTi auxiliary wire) was used to pull tooth 22 to the main arch. Meanwhile it was possible to start in the mandible, to allow a simultaneous coordination of the upper and lower arches. A new CBCT was done to re-localize the MD and study its relationship with contiguous roots (Figure 2B). A simple surgical operation was performed to extract the MD, and the palatal anchorage appliances at the same time. Treatment progressed with space closure in the lower arch and special bends of vestibular root torque were applied on 19 × 25 SS upper wire, along with a 180° reversed lateral incisor bracket to allow the expression of negative crown torque/positive root torque. Illustration shows a good healing in the zone of former presence of both the miniscrew and the MD. Good molar and canine class I relationships were achieved while a small midline deviation was still present probably due to tooth-size discrepancy between upper and lower arch (Figure 5). The panoramic radiograph showed good root parallelism. The profile was preserved due to premolar extractions. Two year after the end of treatment the results were stable (Figure 6). It has been registered no significant incisors roots resorption since the surgical procedure was eased by a wider surgical access area, a reduced bony support loss was obtained during surgery and orthodontic force was kept under control by limiting the application of torque on maxillary centrals and the use of rectangular arch wires (14). MD is the most common supernumerary tooth in permanent dentition and occurs as a result of genetic and environmental factors. It has a great potential to disrupt normal occlusal development, therefore a well-planned intervention to remove it is usually required to obtain reasonable alignment and occlusal relationship. This patient had severe upper crowding, midline deviation and MD. It was possible to achieve satisfactory results along with functional occlusion, dental alignment and facial aesthetics. Authors’ Contribution: Study concept and design, Luis Huanca Ghislanzoni, Frederick Berardinelli, Costanza Tagliatesta, Alessandra Lucchese; Acquisition of data, Luis Huanca Ghislanzoni, Costanza Tagliatesta; analysis and interpretation of data, Luis Huanca Ghislanzoni, FB, Costanza Tagliatesta, Alessandra Lucchese; drafting of the manuscript, Luis Huanca Ghislanzoni, Frederick Berardinelli, Costanza Tagliatesta, Alessandra Lucchese; Critical revision of the manuscript for important intellectual content, Luis Huanca Ghislanzoni, Frederick Berardinelli; statistical analysis, administrative, technical, and material support, Luis Huanca Ghislanzoni, Alessandra Lucchese; Study supervision, Luis Huanca Ghislanzoni.